Flemish painter and draughtsman, active in Bohemia. He was a free master in Antwerp in 1589. The hypothesis that Stevens visited Italy in the early 1590s cannot be proved; it is based only on a series of small, rather primitive drawings dated 1590 or 1591 (Vienna, Akademie der Bildende Kunst), representing mainly ancient monuments in the vicinity of Rome and Naples. These drawings, however, are probably copies by Stevens, possibly after Jan Breughel the Elder. The earliest original works by Stevens are four drawings dated 1592. In 1594 Stevens was appointed court painter to Emperor Rudolf II in Prague, where he may have known Roelandt Savery. There he specialized in depicting peasant festivals and mountain scenes. The court workshop reproduced Stevens s landscape designs in pietra dura for furniture decoration. Engravings also disseminated the designs. In Prague, Stevens s interest in light and atmospheric effects expanded these themes, which later became popular in Dutch art of the 1600s. He also developed landscape as an independent genre, without figures or animals. His colourist tendencies were clearest in his drawings, when he changed his media from pen and dark ink against deep blue washes to brush and soft tones. 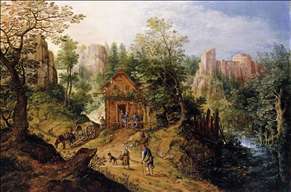 He may have been influenced by Jan Brueghel the Elder s 1604 visit to Prague, for Brueghel used a similar wash technique. After Rudolf s death, Stevens may have worked for Prince Charles of Liechtenstein, Stadtholder of Bohemia, from at least 1620 to 1624. His son and grandsons were also painters in Prague. 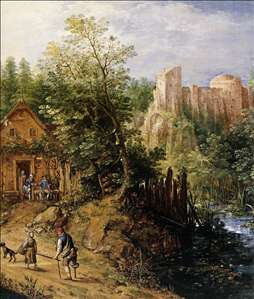 See more details about "Mountain Valley with Inn and Castle"
See more details about "Mountain Valley with Inn and Castle "